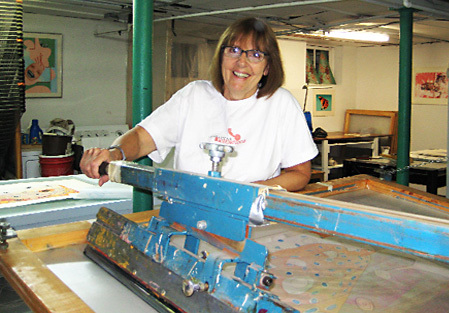 Roni Henning is the author of two books on water-based screenprinting. Her latest WATER-BASED SCREENPRINTING TODAY published by Watson-Guptill covers all the newest hands-on techniques and computer generated photo stencils. Henning is an Artist and a Masterprinter and has worked with some of the top Artists and Publishers in the field. These include Warhol, Bearden, Grooms, Youngerman and Pace Gallery. Check out Roni Henning’s page on Non Toxic Printing’s website. I have been a printmaker (primarily screenprinting) for over thirty years, making fine art editions for artists, both emerging and well known. Among those artists was Agnes Martin, Romare Bearden, Jack Youngerman, Alice Neel, Andy Warhol, Red Grooms and Larry Zox. Eighteen of those years were spent at The New York Institute Of Technology’s Screenprint Workshop as their masterprinter-in-residence. The Workshop was a unique facility that allowed artists to make limited editions of their art in collaboration with the masterprinter. It also permitted the students to have an opportunity to watch prints being made professionally by established and prominent artists. In that way it functioned as a teaching facility. I also taught the screenprinting, etching and design classes at the college. At that time the Screenprint Workshop was a solvent-based facility with oil-based inks and naphtha and acetone as the cleaning materials. Although there were fans there was no exhaust system to remove the bad air and replace it with fresh.Such a system was very costly and the college couldn’t afford it. It was after completing a forty color edition of 600 prints that I started to question what I was doing to myself, the environment and my students.Printers are a rigid breed and once they have developed a system of printing that works well, they are reluctant to change.I myself had felt this reluctance.I didn’t realize that if something is poisoning you and the environment it can hardly be considered to be working well, even though the product looks good.Once, when I was working for another print studio in New York City, and I was traveling home on the subway, I overheard two people commenting on how they thought they were painting the subway cars. But I knew it was only me, my clothes smelled of silkscreen ink. There were water-based inks out there at this time that were used for crafts in schools but they had a limited, poor color range and because of the water content they also buckled the paper. Some art colleges were using a toner and transparent base system but none of that was professional enough for the artists and galleries that I worked with. I was a printer that was used to mixing colors from gallons of opaque ink with a large diverse palette. I could then add transparent base if need be, but I would also have the opacity if that was what the print required. So I started to look around for options. TW Graphics is a silkscreen supplier located in California. They were recommended to me by a fellow printmaker. They offered a line of opaque water-based inks that they claimed was comparable to their oil-based line. So between 1985 – 86 I tested and printed with their inks. It’s one thing to print your own art work and maybe accept some imperfection but not when you are editioning for other artists and major publishers like Pace Gallery. So it took time to get the results that I needed. There were problems, particularly with ink not drying thoroughly and having prints stick together when they were stacked. Today those inks have been reformulated and the sticking problems solved. Even though there is nothing comparable to oil-based fast dry enamel and lacquer inks there is enough variety in the water-based line to make any health and environmentally concerned person switch. Every artist that I work with tells me how wonderful it is to work in a toxic free print shop. The reason I wrote my first book “SCREENPRINTING: WATER-BASED TECHNIQUES” was to showcase the creative, high quality prints that were made with water-based inks and to assist serious printers and artists in their transition from an oil-based system. When I was experimenting with perfecting my printing techniques with the water-based inks I started playing with other watersoluble materials to see if I could print them through the screen. That’s how I started making monotypes with a screen. First I tried various watersoluble crayons and pencils but soon discovered how to use watercolor and gouache to create unique monotypes and monoprints. My second book published by Watson-Guptill, “WATER-BASED SCREENPRINTING TODAY” has a chapter on making a monotype, or monoprint with a screen, and shows a variety of prints made by other artists working with me.